A few weeks ago I was scrolling through the Internet and I found a blog post all centered around this mother’s questioning of how, why, and even should she teach her children the Bible. Her questioning was totally valid, recognizing that baby Bibles are only skin deep and don’t truly capture what the story is really about. Most of the concepts in the Bible are too complex for her toddler to grasp. Most of the Bible is pretty R rated when you think about it. I don’t remember the blogs name, nor the author. Honestly, I read it, closed the window, and planned to go on with my day, not thinking much of it. However, her thoughts and questions have lingered with me, even two weeks later. I can totally see where she was coming from, and it shook me. Why am I doing devotions with my babies? Is it simply to live some shallow Christianity? To put a mark on my “Good Christian Mom” checklist? So I’m answering those questions, both for myself and maybe for someone else who needs to read this. First off, I’m going to say no, introducing the Bible to your toddler isn’t about checking off a legalistic checklist. And I don’t necessarily think there’s necessarily a right way to do it, but I do think it’s important. When we do devotions with our children we are communicating the gospel, planting seeds and meditating on Gods word for our selves. We are a living parable of Gods love for our children. Now we aren’t perfect, we can never be a perfect reflection of God. That’s Jesus’ job. So we need to remember to give ourselves grace in the journey. But when we seize those tender moments with our kiddos and choose to engage with them the best we can, that’s where Christ, his love, and the Gospel can be shown to our toddlers. They probably won’t remember the stories or the activities quite yet, but they remember you were with them, like God is with us . When we do devotions with our toddlers, we’re planting seeds that will grow with our children. When we read that baby Bible, we plant a seed that the Bible is for them. When we open up a sensory bin and use it to talk about the Bible, we’re showing them that they can engage with scripture. And when we listen to that song one more time, we are helping bury truths in their heart that will last a life time. We always have a media portion in our week. First of all, because sometimes we need a little TV time for mama to regain her sanity. But also for the powerful effect music has on the mind. I think of the numerous stories of Alzheimer’s patients, where they have lost memory of everything else, but they can still sing the hymns they learned in Sunday School. We use music to teach children everything from the weather to the alphabet. We even sign up for classes where we sing songs to our babies in hopes of developing their brains. So why would we not do the same with the word of God? In fact all the activities we do in our devotions are geared to help them learn on their level. And no, they are not going to understand it all yet. We don’t teach a 2 year old to count and automatically assume they will know algebra. It’s a little at a time, on a level they can grasp. And Toddler level that’s not a lot, but as my baby girl runs around the house singing about Noah’s Ark at the top of her lungs, I know something is sticking, and I’m trusting that seed will reap a harvest. Finally, I think it’s important to do devotions with our children for ourselves. I don’t know about anyone else, but my life tends to be crazy. And as much as I would love to take half an hour in the morning to sip my coffee, and really dive into the Word, that generally isn’t a reality with 2 under 2. Doing devotions with them, actively engaging them with scripture lends opportunity for me to meditate on the truth I want to instill in my kiddos. Playing with Noah’s Ark and remembering God’s mercy in the rainbow. Counting rocks, and remembering God’s faithfulness to David. As I pray my girls would learn the character of God, I am drawn to meditate on his character revealed in these stories. That our God is a God of mercy and compassion that can redeem all my mom flaws. That he gives purpose to seemingly mundane days of motherhood. 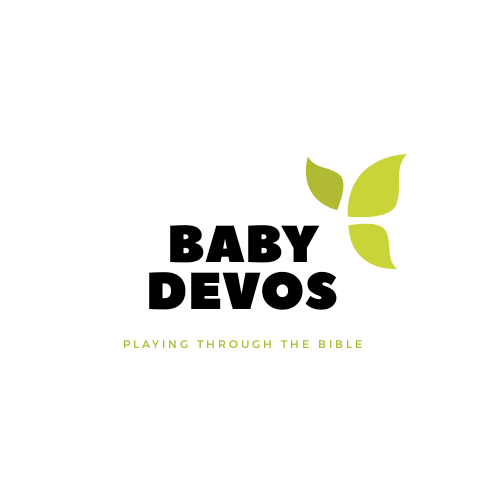 Whether you’re a new believer, learning these stories right along with your kiddos, or you grew up in church and were practically born saved there is something to glean by studying scripture with your babies. There definitely isn’t a right way to introduce your littles to the Bible, but I definitely think there’s a few wrong ways. More than any, doing nothing. If we love God’s word and want to pass down its truth to our children, but don’t actually do anything with it in our homes are we really being truthful? We may make mistakes, but God is bigger than our parenting mistakes. And when we are faithful to plant seeds in our children’s heart of Gods compassion and love, and encourage an interest in the Bible, the Lord will be faithful to redeem our mistakes. What are your thoughts on this? This is a little deeper than I thought I’d go in this blog, but I just couldn’t shake these questions and figured I’d put my thoughts out there just in case someone else is wrestling. I’d love to hear your thoughts. Comment Below.